The award winning country trio Rascal Flatts & upcoming pop star Kelsea Ballerini are hitting the Farm Bureau Live stage on Sunday 14th August 2016! Rascal Flatts are widely known for their energetic performances and sell out shows around the world… this year they plan to start a Riot on their thirteenth tour! With an endless back catalog of all your favourite songs, they plan to give fans a show they will never forget. The Rascal Flatts’ latest studio album, “Rewind,” smashed the charts at No. 1 on the Billboard Country Albums chart, and their single, “I Like the Sound of That" is brewing up a storm for the epic upcoming experience that is about to take place! Rascal Flatts are one of country's biggest and most popular acts, with an incredible list of achievements including more than 25 singles, of which 12 have reached No. 1 on Billboard Hot Country Songs and/or Country Airplay, as well as seven certified platinum albums! Their longest-lasting number-one hit, a cover of Marcus Hummon's "Bless the Broken Road", spent five weeks in that position in 2005! This talented trio is an all time favorite amongst live music fans, as they return almost yearly with another sell-out, unforgettable tour! 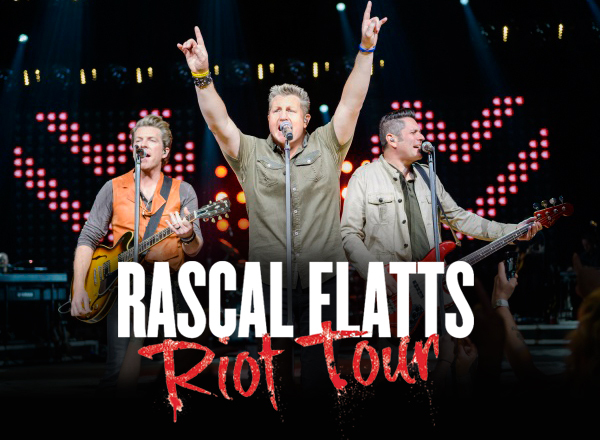 If you are a fan of the Rascal Flatts then don't miss them as they cause a riot across North America this Summer season! "With pyrotechnics, dancing girls, witty between-song banter and a general party atmosphere, it's no wonder why. Rascal Flatts concert tours sell out fast, so make sure to get tickets early."